I think I should’ve been a detective. I mean, at least I consume enough media about the topic. And anyone that’s paid any attention to our site knows of my love for Sherlock Holmes: Consulting Detective. Sherlock’s probably my favorite character of all time, but after a while, you do long for a setting where indoor plumbing is a little more prevalent. So I was really excited when I got my hands on Detective because I would finally get a modern take on crime solving. Put out by Portal Games in 2018, you and your team take on the role of… well, detectives… out to solve crimes as you work for the Antares National Investigation Agency. And being that you are working in modern times, you get to use the greatest tool of all: the Internet! 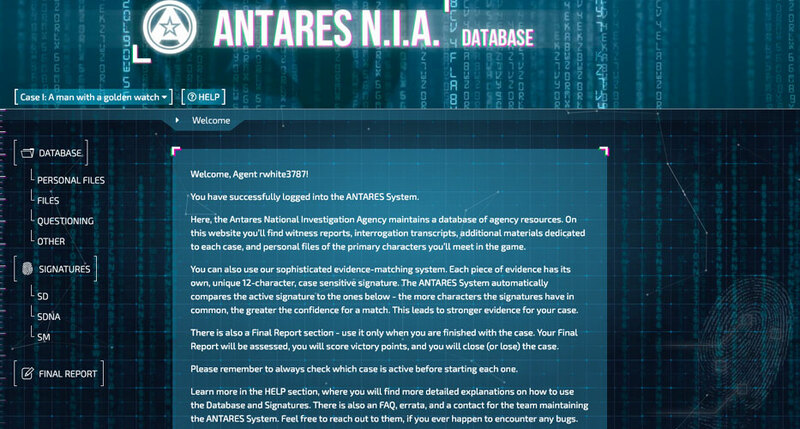 You’ll be using the Antares database to check out suspects, old case files, and other digital info while keeping track of DNA found at different crime scenes. 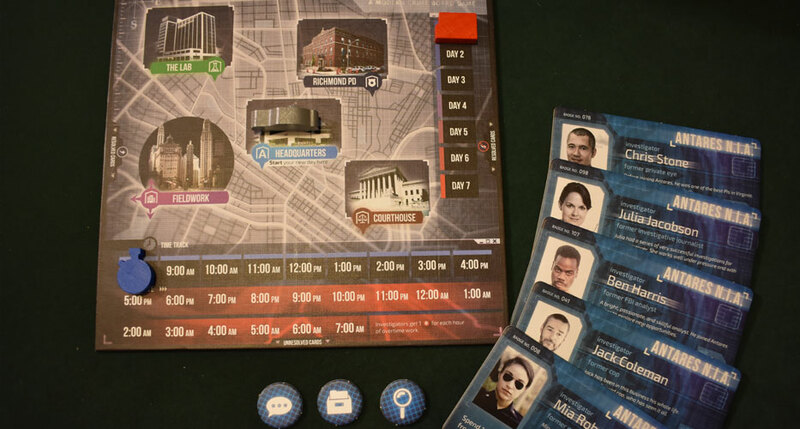 Do these modern upgrades freshen up the board game detective experience? Well, yes and no. 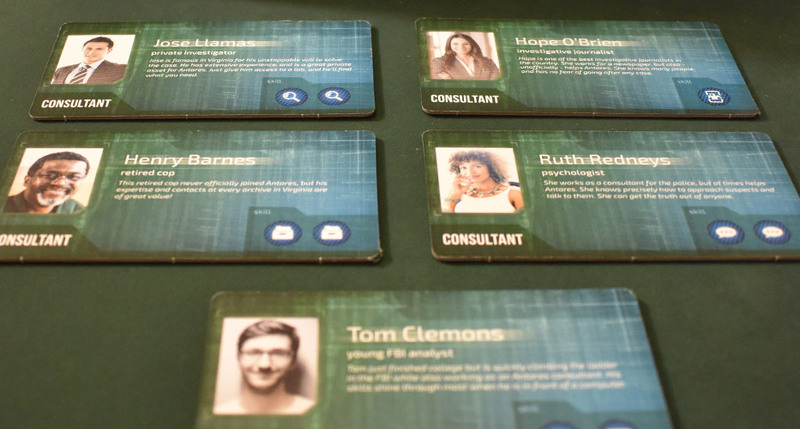 Each player will choose from a set of investigators, each of which gives you some different benefits as you tackle the case. You’ll then read a case opening, setting the scene and giving you some options on how to begin your investigation. It’s at this point that you’ll begin to use the two sources of information: the database and the deck of cards. In the database, you have the option of pulling up bios of people of interest, as well as interviews conducted with them and evidence connected to them. Each data point connects to many others, so you and the team can go down the rabbit hole pretty far as you seek to solve the mystery of each case. The other source of information is a deck of cards. These provide more of the story to the case, as they include some flavor text that describes you navigating office buildings, building up relationships with co-workers, and basically trying to fight the bureaucracy that all good cop shows and movies teach you about. The cards are also where the investigation does most of its progression. You’ll be prompted to draw cards at various points in the investigation, with each one representing you checking out a source. Doing so requires you to spend time, which is your limitation in the game. Checking in with an old contact might be two or three hours, while looking for an old case file might just be one. You have to finish your work by 4 PM each day or you’ll add ‘stress’, which takes away points from your total score. Score, you say? (Or I say… or write… whatever). Yes, after going through the clues and the cards, you’ll eventually have to wrap up your work and answer some multiple choice questions to prove your knowledge of the case. Add your results for these questions to how many different DNA matches you’re able to make, take away your stress points, and you’ll get your final score. Does this really matter? Not really, but hey, points! Detective really does give you that sense of being a modern detective. As you use the database, you’ll really feel like you’re getting a better understanding of what’s going on. From time to time, the game will reference certain concepts that you can Google. The website has some very helpful features, like providing links on the main page to items that you’ve already researched. The physical parts of the game are pretty nice, too, with the cards being a fun way to navigate the story. There are also some surprises to be found as you go through the cases, and I found that pretty amusing. For my wife and me, it was also a nice change of pace to have a more modern feel to our mystery. There’s no denying the charm of a story set in Victorian England, but you get tired of soot covering everything after a while. Detective feels very modern, which certainly helps you better identify with the characters found in the mysteries. The first case we played through is pretty well made if a little straightforward. The clues led into each other well, and the final solution made sense. It’s a really good game to play with friends and family, as you all feel like you can contribute to the discussion of what should happen next. You’ll also really like that sense of accomplishment you get when you crack the case. That being said, this game is a bit harder to approach with multiple people than Consulting Detective. In that game, one person could be reading from the clue book while another checks out the newspapers or looks at the map. Here, so much of the action is focused on the computer that it caters itself more readily to one player doing all the work and the others listening. While our setup involved my wife going through the database and me taking notes, it just didn’t seem to have the same sense of camaraderie as Sherlock Holmes or even Chronicles of Crime. While I can understand wanting a well-rounded story, some of the cards just went on and on and on. They attempt to give you insight into the “real life” of a detective, but there are just so many comments about water coolers, lazy co-workers, and more that it was more boring that engaging. My least favorite moment of the game occurred when we decided to go look at an old file, and one of the cards spent the whole time describing our physical movement towards the file. It then referenced us to an entirely different card which contained the information we actually needed. I also did not like mechanism by which you spend tokens to get new clues. In theory, this mechanism would add some risk and resource management to your investigation, as the clues sometimes really help you out but other times are nothing but rabbit trails. But that’s not something I’m wanting as I solve a mystery. I shouldn’t have to rely on probability to determine the success with which I solve the case. This issue is exacerbated even further when you consider that the tokens you need for hints are determined by your characters, and you’re not really sure ahead of time what types of tokens you’ll need. The worst part of our experience, though, was with the website. We played this game in late December 2018, and at that time, the website seemed to be partially crashed. As a result, it took us 30 seconds to load each page, and when we tried to find our final score, the game had not registered our DNA matches. Thus, our score was lower than it really should have been, but we’re stuck with that score because you can’t replay the case. While technology issues can ruin any gaming experience (board or otherwise), it’s an even bigger deal when it’s a game like this that you can only play once. The website seems to be working better now, though there’s no guarantee that it will stay that way, and there’s no telling how long the company will continue to support the server. Should Portal Games ever decide to pull the plug on the Antares system, this game will become unplayable. So my first experience with Detective was very underwhelming, but I’m still going to give it another shot. Maybe the website will behave this time, and maybe we’ll experience some better writing. And for anyone who really likes solving mysteries in their games, it would still be hard for me to push you away from this game. I’m glad it’s a part of my collection, and I think we’ll have a good time with it. However, if you haven’t picked up anything like this before, I would certainly recommend that you get one of the three Sherlock Holmes: Consulting Detective games or the great Chronicles of Crime before you get this one. 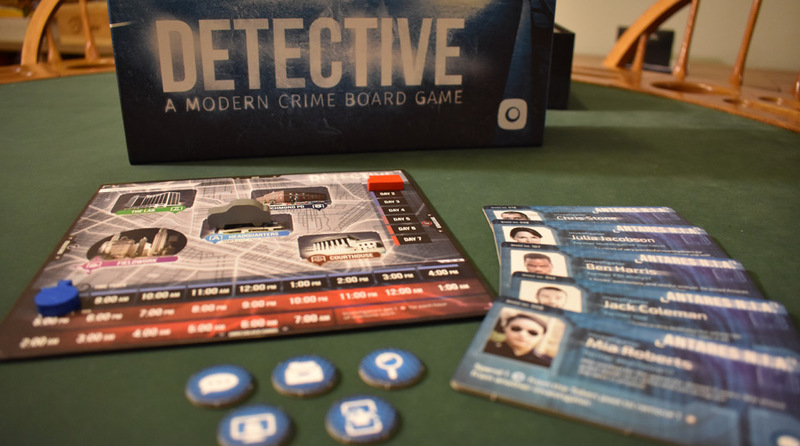 You can pick up Detective at your local game store or purchase the game on Amazon today. Why is there so much text on these cards?